January 2019 - Han Jaehyang (Visiting Scholar, 2015-16) was awarded the 40th Suntory Prize for Social Sciences and Humanities for her book 『パチンコ産業史―周縁経済から巨大市場へ』(The History of the Pachinko Industry--From Peripheral Economy to Great Market) (Nagoya: The University of Nagoya Press, 2018). Further details about the book (in Japanese) are available on the Suntory Prize website. December 2018 - A paper by Yang Bin (Visiting Scholar, 2011-12) entitled "‘Exodus: Lotus Seals and Sealings in a Transregional Perspective" received the first prize at an international forum on images, seals, and sealings organised by the Xiling Seal Art Society in November 2018, and he was admitted to the Xiling Seal Art Society (西泠印社). Founded in 1904, the Xiling Seal Art Society is arguably the only scholarly organisation from the late Qing dynasty that has survived until the present day. The society is dedicated to the practice and studies of traditional Chinese seals, sealings, stone and metal artifacts, paintings, and calligraphy. October 2018 - Jack Meng-Tat Chia (RSEA Fellow, 2009-2012)'s dissertation, "Diasporic Dharma: Buddhism and Modernity across the South China Sea,” has been awarded the 2017 Lauriston Sharp Prize for best doctoral dissertation on Southeast Asian Studies by the Cornell Southeast Asia Program. Named in honor of the founder of the Southeast Asia Program, Lauriston Sharp (1907–93), the prize is awarded each year to a recent PhD who has contributed most outstandingly to both scholarship on Southeast Asia and to the community life of the Southeast Asia Program. Li Zhen (Visiting Fellow, 2015-16) received his Ph.D. from Peking University. His Ph.D. dissertation, entitled 《邵雍哲学思想研究》(A Study on Shao Yong's Philosophy), was awarded the 2018 Excellent Dissertation Award by Peking University. He is currently an assistant research fellow at Xinya College & the Department of Philosophy in Tsinghua University. August 2018 - Huang Jie (Chinese Politics Training Program Visiting Fellow, 2016-17) received his PhD from the University of Hong Kong and will start teaching at Nanjing University as an Assistant Professor in September 2018. May 2018 - National Taiwan University has recently established a new research center, Global Asia Research Center (GARC) and Lan Pei-Chia has been appointed the founding director. The center received donation from Kim Koo Foundation in South Korea and has the mission to promote comparative and transnational research in Asia. February 2018 - The Chinese translation of Amos Oz's Scenes from Village Life, translated by Zhong Zhiqing (Visiting Scholar, 2011-12), was awarded the first Jingdong Prize in Foreign Literature for best translated work last year. Prof. Zhong's translation was also selected as one of the 50 favorite books of 2016 (by the 全民阅读活动组织协调办公室). January 2018 - PK Anand (Urban Studies Training Program Fellow, 2016-17) has been selected as part of the second cohort of the China-India Scholar Leaders Initiative (2018-20) of the India China Institute, The New School, New York City. Chiu Tuen Yi (Visiting Fellow, 2014-15)’s Ph.D. thesis was awarded the Young Scholars Thesis Award 2016 by the Chinese University of Hong Kong. Her thesis looked at spousal dynamics, transborder mobility, and family functioning of cross-border families formed by Hong Kong men and mainland Chinese women. Dr. Chiu has joined the Asia Research Institute (ARI), National University of Singapore as a Postdoctoral Fellow in the Asian Migration Cluster. October 2017 - PK Anand (Urban Studies Training Program Fellow, 2016-17) was recently awarded his Ph.D. from the Centre for East Asian Studies, Jawaharlal Nehru University, New Delhi. His dissertation is entitled "Market Dynamics and State Responses in China: Social Welfare and Industrial Workers, 1987-2008." September 2017 - Cui Wendong (Comparative Literature Training Program, 2015-16) has joined the Department of Chinese Language and Literature, Chinese University of Hong Kong as a research assistant professor. Dinh Hong Hai (Visiting Fellow, 2008-09) was appointed Associate Professor in the Department of Anthropology at Vietnam National University - Hanoi in 2016. He is also serving as Deputy Director of the Research & Development Center of Ethnic Minorities, Mountainous Regions and Red River Basin (RDEM). August 2017 - Huang Jie (Visiting Fellow, 2015-16) received his Ph.D. in Chinese history in May 2017. His dissertation looks at reinterpreting certain words and sections in the text of the Kang gao, Jiu gao and Zi cai chapters of the Shang shu 尚書 (Book of Documents) based on materials gleaned from both received and excavated early Chinese texts. He is currently an assistant research fellow at the Advanced Institute for Confucian Studies, Shandong University. Li Moran (Mesoamerican Archaeology Training Program, 2016-17) is now working in the Institute of Archaeology, Chinese Academy of Social Sciences. July 2017 - Nguyen Quang Dung (HYI-NUS Joint Doctoral Scholar Program, 2011-15) received his PhD from the National University of Singapore in July 2017. His dissertation is entitled ‘Guardians of the forest’: Local Knowledge and Environmental Policy in a Northern Thai National Park. He is currently a lecturer at Vietnam National University – Ho Chi Minh City. Zhou Tingsheng (Visiting Fellow, 2015-16) completed his PhD at Minzu University of China, with a doctoral dissertation entitled《彝语腊罗话语法研究》 (Studies on the Grammar of the Lalo Language). He will start a new position at Dali University, Yunnan, as a Lecturer in the Department of Language and Literature. He was also recently awarded a fellowship from the Firebird Foundation for Anthropological Research for a project entitled "Collection of Lalo Oral Literature.” Under the support of this fellowship, in the coming year and half, he will record folk stories in his native language. Jack Meng-Tat Chia (RSEA Fellow, 2009-2012) has completed his PhD at Cornell University with a dissertation titled “Diasporic Dharma: Buddhism and Modernity across the South China Sea.” He will start a 2-year postdoctoral fellowship at UC Berkeley's Center for Buddhist Studies in the fall of 2017, after which he will return to teach in the Department of History at the National University of Singapore. June 2017 - Xing Wen (Visiting Fellow, 1994-95) curated the first-ever fractal calligraphy exhibition “Fractal Calligraphy: Explorations in Technical Calligraphy Studies, Chinese Manuscript Culture, and Mathematical Art History” at the Russo Gallery, Dartmouth College, from April - May 2017. A recipient of the 2nd China Fine Arts Award (2014), Xing Wen envisioned, invented, and taught Fractal Chinese Calligraphy 中国分形书法 at Dartmouth. Phung Minh Hieu (Doctoral Scholar, 2010-13) recently completed a PhD in History at the University of Hawaii at Manoa with a dissertation entitled, “Land & Water: A fifteenth-century history of Vietnam from an environmental perspective." May 2017 - An essay by Nguyen Nam (Visiting Scholar, 1991-92; Doctoral Scholar, 1994-98), entitled “Ethics without Borders: Translation and Palimpsests of Chugaku rinrisho in East Asia at the Beginning of the 20th Century,” won first prize in the Inoue Yasushi Literary Essay on Japanese Literature (co-sponsored by the Inoue Yasushi Foundation and Japan Foundation, March 2017). April 2017 - Zhang Longxi (Doctoral Scholar 1983-87) recently delivered the Sisir Kumar Das Memorial Lecture at the Comparative Literature Association of India's International Conference, held in March 2017 at Visva Bharati University, Santiniketan, India. Zhu Xufeng (Visiting Scholar 2008-09) obtained the China National Science Fund for Distinguished Young Scholars in 2016, which is awarded to Chinese young scholars under the age of 45. January 2017 - A book by Kamimura Yasuhiro (Visiting Scholar 2012-13), entitled 『福祉のアジア――国際比較から政策構想へ』(Welfare Asia: Comparison and Vision), won the Special Prize at the 28th Asia-Pacific Awards (sponsored by Mainichi Newspapers and the Asian Affairs Research Council) in November 2016. Zhang Longxi (Doctoral Scholar 1983-87) recently co-organized a symposium on “China and the World: Observation, Analysis, Prospect.” The symposium, which was held at Yenching Academy of Peking University, brought together an international group of distinguished scholars to conduct an intellectual dialogue based on each participant’s personal experience, observation, and analysis. A summary of the event is available on the Yenching Academy website. An interview with Peng Guoxiang (Visiting Scholar 2007-08), "At the Library: An Interview with Peng Guoxiang, 2016 Kluge Chair in Countries and Cultures of the North, Library of Congress," was recently published. December 2016 - Nguyen To Lan (Visiting Scholar 2013-14) has been awarded the 2017 Balaban Award for a junior scholar working in the field of traditional Vietnamese language and literature. The Balaban Award to a junior scholar is awarded by the Vietnamese Nôm Preservation Foundation to an individual or group of individuals who have contributed significantly to furthering the Foundation’s vision of preserving Vietnam’s 1000-year cultural heritage embodied in the large corpus of texts written in the Hán-Nôm script and making that heritage accessible to a wider audience. October 2016 - Kim Sun Ju (Visiting Fellow 2005-06) is a senior researcher (先任硏究員) at the Academy of Korean Studies. Qi Liang (Urban Studies Training Program, 2014-15) has joined Zhengzhou University as a lecturer. September 2016 - Nguyen Tuan Cuong (Visiting Scholar 2013-14) has been appointed Director of the (Vietnam National) Institute of Sino-Nom Studies (越南漢喃研究院) at the Vietnam Academy of Social Sciences. Fan Shuhua (Visiting Scholar 1996-97) received the 2016 Florence Tan Moeson Fellowship, Asian Division, Library of Congress. Professor Fan has been appointed Commissioner on the Pennsylvania Governor's Advisory Commission on Asian-Pacific American Affairs (from Nov. 2015 - Nov. 2017). She is also the recipient of the 2015 Award of Excellence in Advancing Global Learning, University of Scranton. August 2016 - Nguyen Kim Son (Visiting Scholar 2007-08) has been appointed President of Vietnam National University, Hanoi. An Yelee (Visiting Fellow 2010-11) has joined the Academy of Korean Studies (Division of Humanities, Korean Linguistics) as an Assistant Professor. Zhang Longxi (Doctoral Scholar 1983-87) was recently elected as President of the International Comparative Literature Association (ICLA) for a 3-year term from 2016 to 2019. The 21st Congress of the International Comparative Literature Association was held at the University of Vienna, Austria in July 2016. July 2016 - Peng Guoxiang (Visiting Scholar 2007-08) has been named the Kluge Chair in Countries and Cultures of the North at the Library of Congress John W. Kluge Center, Washington, D.C, where he will be in residence for six months. June 2016 - Yao Dadui (Visiting Fellow 2011-12) was recently promoted to Associate Professor in the Department of Comparative Literature at Sun Yat-sen University. May 2016 - A course taught by Cao Jin (Visiting Scholar 2009-10; Associate 2016), entitled "Political Economy of Communication" (传播政治经济学), was named one of Fudan University's Excellent Courses in 2016. Within the entire university, only 25 courses were named to the list. October 2015 - Pan Lu (Urban Studies Training Program 2011-12) has joined the Department of Chinese Culture, Hong Kong Polytechnic University, as an assistant professor. September 2015 - Lee Soyoung (Visiting Fellow 2008-09) has recently joined the faculty of Jeju National University as an assistant professor. July 2015 - Yao Dadui (Visiting Fellow 2011-12) has joined the Departmentof Chinese, Sun Yat-sen University as an assistant professor. He was previously a post-doctoral research fellow at the National Institute for Advanced Humanistic Studies, Fudan University. June 2015 - Kwon Huck-ju was recently elected Editor-in-Chief by the General Assembly of the Korean Association of Public Administration, where he will serve as editor from 2015 to 2016. February 2015 - Zhu Xufeng (Visiting Scholar 2008-09) received the 2014 Youth Award for Management Science in China from the Chinese Society for Management Modernization. He is the first researcher in the field of public administration to win the award. June 2014 - Hoang V. Nguyen (Doctoral Scholar, 2008-12) was recently awarded the 2014 Graduate Student Prize of the Vietnamese Studies Group of the Association for Asian Studies. His paper, entitled "Side Effects of De-territorialization Policy: Countering the Homeland Government from the Vietnamese Diaspora", comes from a chapter of his current dissertation draft. By engaging in a diaspora and a de-terriorialization theoretical perspective, the paper discusses the relationship between Vietnamese Americans in New Orleans and their hometowns and the homeland government. The prize was announced at the Annual Meeting of the AAS in March 2014. May 2014 - Zhu Xufeng (Visiting Scholar 2008-09) received two academic honors in 2013 from the “National Young Talent Support Program” (国家青年拔尖人才支持计划) and the “National Outstanding Youth Science Foundation” (国家优秀青年科学基金), which are awarded to the best young scholars under the age of 35 and 38, respectively, in China. February 2014 - Wu Fengshi (Visiting Scholar 2008-09) was promoted to Associate Professor in the Department of Government and Public Administration at the Chinese University of Hong Kong. June 2013 – Yao Dadui (Visiting Fellow 2011-12) received his PhD in Literature from Sun Yat-sen University in June 2013. He will be a post-doctoral fellow at the National Institute for Advanced Humanistic Studies, Fudan University in the fall. This June he will attend The International Convention of Asia Scholars (ICAS8) in Macao, where he will present a paper on the Chinese assistants of foreign missionaries, their obscure authorship and their ambiguous identity in the writing process of the 19th century Chinese Christian literature. In July 2013 he will attend the annual conference of The International Association for Comparative study of China and the West (held at Peking University), presenting on “Translated Christianity: Illustrations and Indigenization in 19th century Chinese Christian Novels.” Dr. Yao finished both papers (chapters from his dissertation) during his time at the Institute. May 2013 – Former HYI Visiting Scholar Zhu Xufeng (Visiting Scholar 2008-09) moved to the School of Public Policy and Management, Tsinghua University at the end of 2012. He was formerely a professor at the Zhou Enlai School of Government, Nankai University. February 2013 – Former HYI Grassroots Training Program Visiting Fellow Zhang Han is now a post-doctoral fellow in the Department of Political Science, Tsinghua University. He received his PhD in Sociology from the University of Hong Kong in 2012. January 2013 – Former HYI Visiting Fellow Ido Misato (2010-11) was recently appointed Project Assistant Professor at the Institute for Advanced Studies on Asia, the University of Tokyo. December 2012 – The dissertation of former HYI Visiting Fellow Tran Phuong Hoa (VF 2008-09) has been awarded first prize of the Pham Than Duat Prize (Association of Vietnamese Historians). In addition, her monograph Giao duc Phap-Viet o Bac Ky, 1884-1945 ("Franco-Vietnamese Education in Tonkin, 1884-1945") was recently published by the Khoa Hoc Xa Hoi Publishing House. Former HYI Visiting Scholar Jeong Jong-Ho (VS 2008-09) was recently appointed Dean of International Affairs at Seoul National University. September 2012 – Former HYI Visiting Scholar Sato Fumika (VS 2011-12) has had her paper, "A Camouflaged Military: Japan's Self-Defense Forces and Globalized Gender Mainstreaming" published in Japan Focus. The paper is a revised version of her talk given during her stay as a Visiting Scholar at the Harvard-Yenching Institute. August 2012 – The Taiwanese Harvard-Yenching Alumni Group has issued an activity report from the previous year. With HYI support, they held an international seminar on “Rediscovering Nüshu” in October 2011, and two participants are now in the process of co-editing the conference papers into a volume. Read the Taiwan Alumni report. July 2012 – Former HYI Visiting Scholar Peng Guoxiang (VS 2007-08) was a visiting scholar at the Max Planck Institute for the Study of Religious and Ethnic Diversity from May-August, 2012. November 2011 – Former HYI Doctoral Scholar Kabashima Ikuo (Harvard DSP 1977-79) is the current Governor of Kumamoto Prefecture, Japan. Read the Social Science Research Council article "Professor-Turned-Governor Ikuo Kabashima". October 2011 – Former HYI Visiting Scholar Kinnia Yau Shuk-Ting (VS 2010-11) is Editor of the recently published book East Asian Cinema and Cultural Heritage: From China, Hong Kong, Taiwan to Japan and South Korea ( New York: Palgrave Macmillan, October 2011). August 2011 – Former HYI Visiting Scholar Peng Guoxiang (VS 2007-08) moved to Peking University from Tsinghua University and is jointly affiliated with the Philosophy Department and the newly established Institute for Advanced Humanistic Studies (IAHS). He is a professor of Chinese philosophy, religions and intellectual history in the Philosophy Department and a research fellow and director of the Center for Cultural China Studies at the IAHS. July 2011 – Former HYI Visiting Scholar Zhu Xufeng (VS 2008-09) will have his paper on China's think tanks published in the next issue of The China Quarterly (Vol. 207, Sept, 2011). The paper, entitled "Government Advisors or Public Advocates? Roles of Think Tanks in China from the Perspective of Regional Variations", was written during his stay at the Harvard-Yenching Institute and was first presented at the Harvard Fairbank Center Seminar in 2008. Professor Zhu is currently at the Zhou Enlai School of Government, Nankai University. May 2011 – Former HYI Visiting Scholar Jeong Jong-Ho (VS 2008-09) will have his paper on the restructuring of migrant settlements in Beijing published in the journal Habitat International in July 2011. The paper, titled "From illegal migrant settlements to central business and residential districts: Restructuring of urban space in Beijing’s migrant enclaves", was first presented during his year as a Visiting Scholar at the Harvard-Yenching Institute. Professor Jeong is currently at the Graduate School of International Studies, Seoul National University. Former HYI Visiting Scholar Cao Jin (VS 2009-10) recently co-taught a class on gender and sexuality with Harvard Professor Bradley Epps. 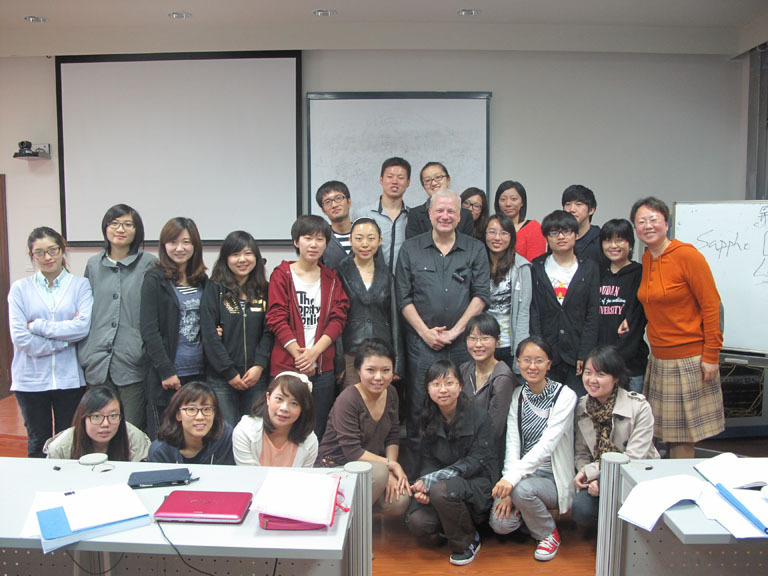 The class was taught at Fudan University, where Professor Cao teaches in the School of Journalism. View a picture of the class. Professor Jiang Bowei (Coordinate Research Scholar, 2009-10) and Professor Michael Szonyi (Professor of Chinese History, Harvard) have recently published an article together: 国家、地方社会とジェンダー政策——戦地金門の女性の役割およびイメージの再現 ("Nation-state, Local society, and Gender Policy: Reproduction of Female Roles and Representations in Militarized Jinmen"). It appeared in 地域研究, Vol. 11 No 1 (2011), pp 88-128. This article was written while Prof. Jiang was a Coordinate Research Scholar at HYI, working with Professor Szonyi of the Department of East Asian Languages and Civilizations. November 2009 - Jun Qian (HYI Scholar 1996-97; Dept. of English, Peking University) was awarded the Jan Masaryk Bronze Medal in September 2009. The medal was established by the Czech Department of Foreign Affairs and is awarded to those who have made a remarkable contribution in promoting Czech culture in a foreign country. In Professor Qian's case, he was awarded for introducing to China the study of the Prague School. Professor Jun Qian's research project during his year at Harvard (1996-97) eventually led to the production of an award-winning monograph (1998) which was the first in China to cover the Prague School. April 2009 - Chu Guofei (Visiting Fellow 2007-2008) returned to Beijing in January 2009, where she will graduate this summer. After receiving her degree she will begin employment as an Editor of the Chinese Academy of Social Sciences Review(中国社会科学院院报), a newspaper published by the Chinese Academy of Social Sciences with an audience of scholars and students in China. January 2009 — Dr. Chang So-an (張壽安) , Research Fellow, Institute of Modern History, Academia Sinica, was a coordinate researcher with the Harvard-Yenching Institute during the academic year 2002-03. She came back to Harvard for a short term research stay, and visited us in January 2009. October 2008 — Huang Chungao (HYI Visiting Scholar 00-01, Associate 01-02) was in town for a short visit. A visiting Fulbright scholar at Brown University for AY2008-09, Dr. Huang is currently doing a project about medieval studies in USA during the 20th century. He is an Associate Professor in the History Department at Peking University, where he teaches medieval history. Our warmest welcome and best wishes to Dr. Huang!